December 5th, 2012 - COLUMBUS, Ind. 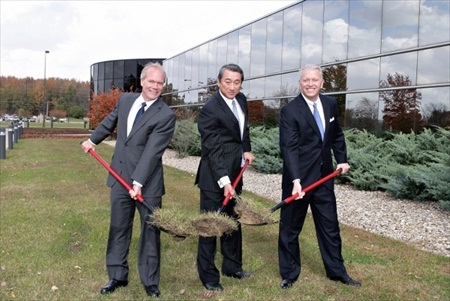 - Toyota Material Handling, U.S.A., Inc., (TMHU), maker of the number one lift truck in North America, celebrated the ground breaking of the expansion of its Columbus, Ind. offices at its manufacturing facility, Toyota Industrial Equipment Mfg, Inc. (TIEM). When complete in 2013, TMHU's new headquarters will represent a multi-million dollar investment, adding 21,400 square feet to the TIEM campus. The expanded office space and conference meeting area is designed to support more than 170 TMHU associates. "Today's groundbreaking event not only commemorates our new headquarters, but also celebrates a commitment to our customers," said Jeff Rufener, TMHU president. "TMHU's new headquarters will bring TMHU and TIEM associates together under one roof, which will combine synergies and allow us to be even more responsive to customer and dealer needs." The extended office space is part of Toyota's strategic initiative, announced in April 2012, to align sales and marketing teams with its manufacturing plant in one centralized location. TMHU's existing Columbus office is physically connected to TIEM, the plant that builds the majority of Toyota lift trucks sold in North America. When complete, the combined TMHU and TIEM campus will total more than 1 million square feet of manufacturing and support space and house approximately 1,000 Toyota associates. Toyota has become the industry leader through unparalleled quality of lift truck design and leading-edge manufacturing capabilities. In 1990, TIEM became the first Toyota lift truck manufacturing plant outside of Japan. Since the first lift truck rolled off the line 20 years ago, TIEM associates have built more than 400,000 lift trucks and Toyota has steadily grown in the North American market to become the number one lift truck supplier since 2002. When TIEM established its state-of-the-art, $60-million lift truck plant operations in 1990, the facility covered approximately seven acres under one roof. Since that time, TIEM has undergone 12 expansions. The campus now totals more than 1 million square feet of facilities sitting on 126 acres. Representing an investment of $118 million, the campus includes a National Customer Center, training center, manufacturing operations, and distribution centers for equipment and service parts to meet the needs of Toyota's customers. 3-wheel and 4-wheel electric lift trucks, internal combustion cushion tire and pneumatic tire lift trucks, diesel tow tractors and DC/AC inverter assemblies for the Toyota Tacoma. TIEM-manufactured lift trucks have received a number of industry accolades including Toyota lift trucks being named number one in quality and value in an independent survey conducted by Reed Business Information for eight consecutive years.